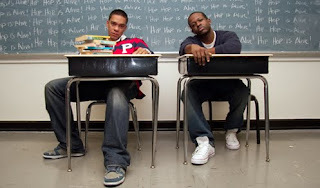 The educated duo that is Kidz in the Hall is back in action with their latest CD "Land of Make Believe". The single "Flickin" was leaked in mid 2009 and was a staple of my summer track list. The classic Kidz in the Hall feel is delivered though the catchy track "Running". Rapper Nalege is able to to show you his nasty quick flow over the catchy electro styled beat. With Canadian Colin Munroe supplying a nice hook the song "Take Over The World" slows the CD down and allows listeners to appreciate a slower version of Nalege's amazing flow.